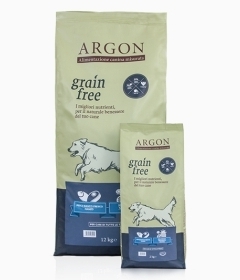 Argon Grain free, born by Argon’s experience, is a line of Italian product, of hight quality, designed to provide the adult dog a combination of rich and balanced nutrient, completely grain free. Six different recipes , combined with a mix of fruit and herbs , a valuable source of vitamins and antioxidants. 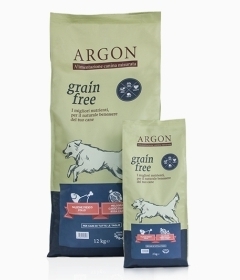 Argon Grain free line is suitable for adult dogs of all breeds and is characterized by a hight level of fresh meat and fruit, in respect of appropriate diet to the carnivorous nature of the dog. It’s a meat rich in vitamins and minerals such as rabbit , with high biological value, typical of pork meat. It’s a mix of fresh fish and meat , with all the digestibility of the chicken and the beneficial properties of salmon , valuable for heart health. Rich in omega – 3 , mackerel is associated with buffalo meat , known for its high biological value and for its extreme digestibility. Ally of the cardiovascular system , the meat of trout and its beneficial properties are associated with the digestibility of duck meat. Light and digestible , white fish , with its low -fat level, is associated with the flavour of the beef. Rich in fatty acids , fresh tuna is associated with the lamb , the noble source of protein and B vitamins.